Present state: Station building is in residential use. Base of signal box used as a relay room. Platforms demolished. The goods yard is occupied by D.A Johnstone Plant Hire Ltd.
Notes: This station opened with the line on 1 July 1847 and, despite its rural location with limited local population to enjoy it, a fine sandstone ashlar building was provided, and it was one of the more expensive of the minor stations, costing £1,281 to build; by comparison Stannington (Netherton) cost £1,200, and Killingworth £1,129, whilst Warkworth was a more ambitious outlay at £1,649. Standing on the down platform the structure contained two distinct houses, one for the stationmaster and the other for the porter, linked by a single-storey office range with an enclosed verandah in front. The northern section projected towards the platform and had a two-storey bay. The usual decorative stone ball finials were in evidence on the gables. The up platform had a more modest waiting shed with a pent roof, and it was also enlivened with ball finials. Two goods sidings were located south of the station, east of the tracks with trailing junctions from the up line; one of them served a lime depot. A further siding, added by 1897, was also south of the passenger platforms and branched northwards from the down track. The signal box was erected in 1873. The Railway Clearing House Handbook of 1904 noted that Longhirst station was equipped with a one-ton capacity crane and that the normal range of goods traffic could be handled: this included furniture vans, carriages, portable engines and machines on wheels; livestock; horse boxes and prize cattle vans; and carriages by passenger train. Ashington Junction and Longhirst Hall Colliery are also recorded under the Longhirst station entry. In 1911 the station served a local population of 1,022 and 11,083 tickets were issued. Goods traffic two years later was principally barley and livestock, and coal would also be dispatched by the nearby pit. 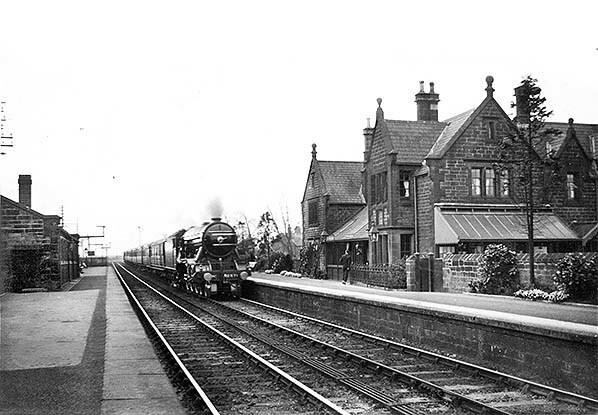 Longhirst was administered by British Railways’ North Eastern Region from January 1948, but the station’s passenger traffic had diminished to the point that closure was inevitable, and this took place on 29 October 1951. The final timetable, effective from 10 September consisted of one daily departure to Newcastle, at 10.59am on weekdays and 6.01pm on Sunday, and three weekday down departures at 8.15am (to Berwick) and at 2.10 and 10.54 pm (to Alnwick). The platforms were demolished in March 1957 but the station continued to handle goods traffic until 10 August 1964. The up side waiting shelter has gone, but the main station building is in use as semi-detached residences and can still be admired from passing trains. The level crossing gates were replaced with barriers in October 1975. 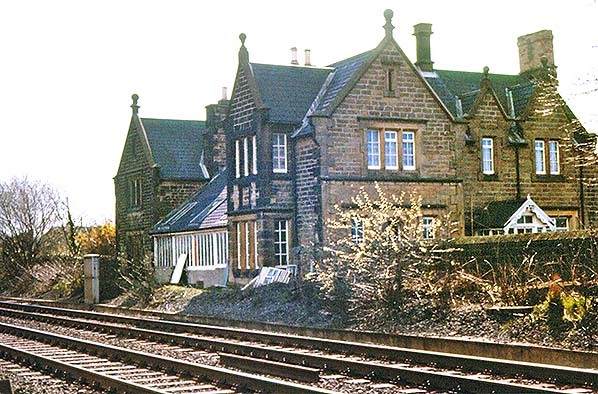 The signal box was reduced to a gate box, released by Morpeth, in January 1977 and it closed in January 1979, its base being retained as a relay room. In April 2015 the station building was for sale with a guide price of £350,000. 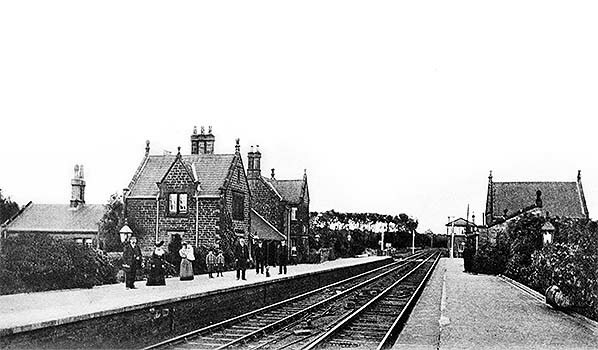 Longhirst station looking north from the up platform c1906. The stately ‘Tudorbethan’ Newcastle & Berwick station building is on the down platform. Its structure – in effect semidetached houses – is apparent in this view. A recessed sheltered area for passengers is provided between the gables of the two houses. The pent-roofed stone waiting shed is seen on the up platform, and the goods shed is beyond; both complement the architecture of the station building. The NER signal box, constructed in 1873, is on the far side of the level crossing, east of the tracks. 1859 1:10,560 OS map. The station’s isolated position can be appreciated. A siding with a loop on the up (east) side entered from the south leads through the goods shed, which is unnamed but identified on a later map. A further siding leads to the lime depot, and another to a goods dock. The signal box has not yet been constructed. north of the level crossing. ‘Aged Mineworkers’ Homes’. Only the longer terrace now survives (Straker Terrace); the shorter terrace at right angles has been demolished. In 1919 No. 732 hurtles through Longhirst station with a southbound express. This photograph of indifferent quality is included because the substantial waiting shelter on the up platform is shown to advantage, and the goods shed can be seen beyond it; this handsome structure complements the station building on the down platform. In 1919 No.723 hauls a southbound goods train through Longhirst. The NER running-in nameboard (cream letters on a terra cotta field) is prominent as is the signal box, also of NER design. The Worsdell-designed 4-4-0 was built at Gateshead works in November 1906. In LNER ownership it was renumbered 2377 and it still carried this number when it was withdrawn by BR(NE) from 52D, Tweedmouth shed, on 31 May 1949. The loco was cut up at British Railways’ Darlington works (North Road) the following month. 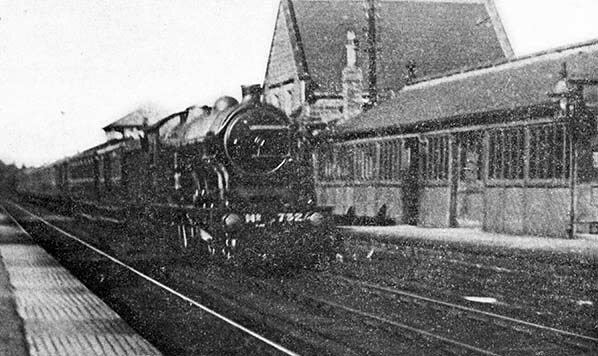 Longhirst station looking south from the up platform on 14 May 1925 at 11.40am as a down express hauled by a D16/3, 4-4-0 loco passes through. On the opposite platform the ‘Tudorbethan’ architecture of the dignified Newcastle & Berwick Railway building of 1847 can be admired, built on a grand scale for a station of limited importance. At this time two verandahs are provided to shelter passengers, one clasped between the gabled sections of the building facing the platform , and another on the northern elevation. The waiting shelter on the up platform complements the main building. 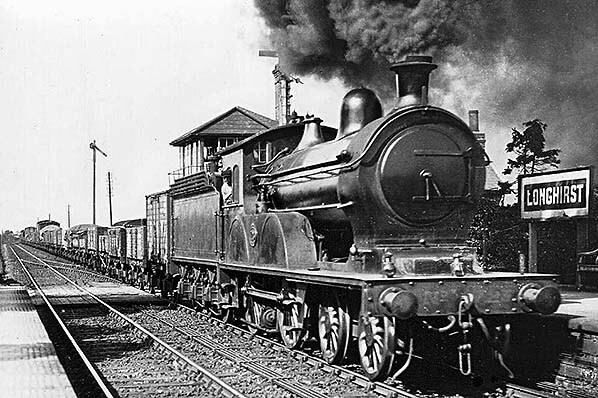 The locomotive was built at the Great Eastern Railway’s Stratford works in June 1909, originally being numbered 1820. Under LNER ownership it was successively known as 8820 and 2571. In BR days the loco was renumbered 62571 and it continued in service until January 1959 when it was withdrawn from 40A, Lincoln shed. It returned to its birthplace at Stratford works to be cut up the following month. The station building at Longhirst in April 1977. Despite serving a modest village a mile distant and a scattering of farmsteads, a structure of generous proportions was built. Attention was given to architectural detail on all elevations of the building, and the collection of self-assured gables topped by ball finials will be noted. The porch, to the right, with its fancy bargeboard is particularly charming. On the platform elevation the formerly open verandah has been enclosed.